The divorce process is a stressful one that can easily bring out the worse in people. Some people even see divorce as a way to seek revenge on a spouse by seizing money and assets. Divorcing people often want to take out their hurt feelings on exes, however it's important not to let emotions interfere with the business at hand. In the long run, being spiteful could harm your own pocketbook. "Asking your lawyer to write a letter to your ex over who gets the $50 coffee table book is kind of nonsensical," said Brendan Lyle, a former divorce attorney and CEO at BBL Churchill, a divorce finance firm. He went on to reveal that a short letter could cost you $500 in attorney fees. Understanding that divorce can be costly, savvy petitioners opt to pick their battles. Individuals often make the mistake of assuming that assets that are in their names can't be claimed by spouses in a divorce. However, divorce experts caution that the opposite is true. "Practically everything is divisible, including frequent flyer air miles or royalties from a book you wrote," said Ann Narris, a Massachusetts attorney with the Narris Law Office & Family Mediation Partners. "Most states issue automatic financial restraining orders prohibiting people from making big purchases or liquidating assets after the divorce is filed, absent a court order or an agreement," said Narris. If you're thinking of filing for divorce or even marriage separation, it's a good idea to take a look at your spouse's financial situation. According to Narris, spouses should start by tracking partners' new credit card and loan applications. "People are more generous in their income reporting on credit or loan applications than they are in, say, their 1040," said Narris, who went on to stress that loan applications could be crucial parts of a divorce discovery. If you're thinking of filing for divorce, it can be tough not to walk out the door when your spouse pushes your buttons. However, Narris recommends that individuals take time to collect evidence before a split. Along with taking pictures of assets, individuals should make copies of account statements and jot down any important numbers. Preparation is key if you hope to come out ahead in court. When it comes to divorce, almost all property is fair game. However, spouses can't hope to get their fair shares if they don't know the value of assets. "No sense in guessing on the worth of his baseball cards or your engagement ring -- never mind a house or a business," said Narris, who reminds couples that there are experts available who can appraise just about anything. You can try to deceive your spouse by hiding or concealing assets, but don't forget that you're also messing with the law. According to Narris, if what you're hiding is discovered, you'll lose your credibility in court. There could also be stiff penalties, including monetary sanctions. To protect yourself and your property during a divorce, it's best to declare all assets upfront. People who pay alimony are rarely grateful for the opportunity. However, ex-spouses can actually help you out come tax time. According to Narris, people who pay alimony to their exes can write it off as a tax deduction. On the other hand, those who receive alimony must report it as taxable income. It's important to note that alimony is different from child support, which is neither taxable nor deductible. On the contrary, if the transfer of money in a divorce is not considered alimony, the receiving spouse is in luck: these funds aren't regarded as taxable income, according to Christian Denmon, founding partner of Denmon & Denmon, a personal injury, divorce and criminal defense law firm in Tampa. During a divorce, it's important to stay alert to hidden tax obligations. "A husband might have purchased stock for $50 during the marriage," said Denmon. "The stock has gone up in value so that at the time of the divorce, the husband ends up transferring $75 to the wife. If not otherwise addressed in the divorce settlement, the husband will be on the hook to pay taxes on the $25 gain on the stock." "Even if you receive support, the courts can impute income and expect you to be working if your kids are school aged and you are not of retirement age or disabled," said Narris, who cautioned against "depend[ing] too much on a hopeful spousal support award." Updating your education now can help protect you later if things don't go your way in court. Normally, one person in a household manages the finances. However, this arrangement can create a "power imbalance when it comes time to negotiate settlements," according to Narris. So what can you do to protect yourself? It's no secret that divorce can be expensive. In fact, according to Narris, the average cost of legal fees in a divorce is an astounding $15,000! One way to cut down on these expenses is to use a mediator. A mediator doesn't work on behalf of any one party, just facilitates agreements. If you want to keep your divorce details behind closed doors while cutting costs, a mediator might be the best bet for both you and your bank account. "There are many ways to divide your portion of your spouse's retirement asset (called a qualified domestic relations order) so give that due consideration," said Narris. 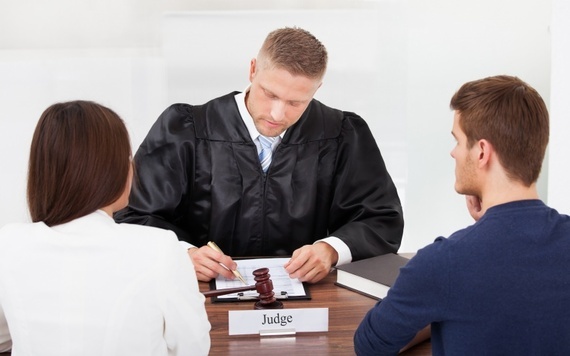 Many individuals are hesitant to shell out for a PI or forensic attorney when going through a divorce. However, according to Eva Cockerham, an attorney with Burke Jaskot law firm in Baltimore, "Private investigators are useful for investigating people who own small businesses, as independent data about numbers of customers, employees and resources can give a much fuller picture of a person's true finances." Likewise, Cockerham noted that forensic accountants can give "insight as to whether a person going through a divorce is getting accurate information from their soon to be ex-spouse." By spending a little now, you might be able to save yourself a bundle in the future. Pick your divorce lawyer wisely, as it could save your bottom line. "Find one that is experienced and knowledgeable, but is also a good fit for you," said Narris. "You have the power to set the tone for your divorce. The attorney should advise you, but also respect your position on how to approach the negotiations." Just because an attorney has a high hourly rate doesn't necessarily mean he or she will honor your wishes. For best results, go with your gut feeling. According to Heather Sunderman, a divorce attorney with Mirsky Policastri in the Washington, D.C. area, too many clients assume partners' debts are joint when they're not. "Some states do not divide marital debt if it's just in one person's name, so if possible, during separation you may want to pay down that debt preferentially," said Sunderman. The last thing you want is to be on the hook for debts you didn't accumulate. Cautioned Sunderman, if you fail to remove these designations, "those amounts may end up being paid out to a former spouse. Usually that's not the result you want!" "The court can order one spouse to contribute to the other spouse's attorney fees," said Denmon, who went on to explain that this type of debt was treated in a special manner. When it comes to court-ordered attorney fees, the judge can throw the offending spouse in jail for failing to pay. In light of these regulations, Denmon advises that spouses who are receiving financial help should have language drafted into agreements clarifying how much money must be paid and by what date. Doing this gives spouses the ability "to enforce the agreement should the paying spouse fail to follow through with his agreement," said Denmon. "If you file single and make more than $380,750, your personal exemption of $4,000 is not available," said Luna. Most attorneys will offer free consultations, said Narris, who advises clients to "take advantage of that and get some basic information, see if the lawyer is the right fit." While you might be tempted to file as soon as possible, it's important to note that property division is based on the date of marriage separation in some states. Typically, the court uses a formal date of separation (DOS) to determine property division and the value of certain assets. "If you are expecting a large increase in the value of a major asset upon a certain occasion, be mindful of that when you decide to initiate the divorce," said Narris. If you're negotiating who will claim a child as a dependent, Narris said, "You can include a provision that the right to claim the child is dependent on the parent being up to date on their support obligation." "Your risk aversion may be very different than your former spouse['s] and you do not need to keep the same investment trajectory you had before the divorce," said Narris. If you don't know where to begin, you might want to hire a financial adviser. Remember to think long-term when planning finances after divorce. "Too many times the necessary documents seem to disappear after a divorce starts, so to the highest degree possible, gather those documents before you start the divorce," said Jeff Anderson, a Dallas family law attorney. Dividing assets and properties isn't always a simple numerical transaction. "Negotiating the division of property is an art form all its own," said Keith Nelson, a family law attorney in Dallas. "It's a three-step process: characterize the asset, value it, divide it." After the asset is identified as community property, separate property or both, figuring out the value can be tricky. "For instance, a bank account with cash in it is pretty easy to value -- look at the balance," said Nelson. "But a retirement account, a house or securities can have more complex issues." "If one of the parties will be liquidating a retirement account early, then the highest marginal tax rate and the early withdrawal penalty might need to be subtracted from the value of the account," said Nelson, who went on to explain that the value of these assets is often drastically reduced as a result. According to Nelson, "Even if the account is not going to be liquidated, the taxes which will be paid on the money at the time of retirement can be considered and a reduction of the overall value of the asset might [be], and very often is, appropriate." According to NOLO, a legal advice website, community property applies to the states of Alaska, Arizona, California, Idaho, Louisiana, Nevada, New Mexico, Texas, Washington and Wisconsin as well as Puerto Rico. On the contrary, every other state uses equitable distribution, which involves "fairly" divvying up assets and money accrued during marriage. Knowing the law of the land can help you avoid surprises during your divorce proceedings. Based off InsideGov's data, the most difficult states to get a divorce include Arkansas, New Jersey, Rhode Island, South Carolina and Vermont. Arkansas takes the longest amount of time at 540 days. If you live in one of these states, you and your spouse might want to consider relocating to expedite the divorce process. "A simple mistake that drops your credit score 40 points can cost you thousands on your next mortgage," said Huettner. "Making a mistake separating accounts, renaming beneficiaries or not setting up life insurance properly can cost you hundreds of thousands and impact you for years." Despite their eagerness to be divorced, many people actually fail to complete all the steps needed to make their divorces legal, according to Huettner. For best results, clients should make sure all their bases are covered and check up on spouses to ensure they have completed the necessary steps. Although federal law might dictate that you have health insurance access under your former spouse, Narris cautions clients against relying on COBRA coverage long-term due to the high cost. Her advice: "Start doing legwork for available options that may be less expensive. Better yet, find a job for yourself that has benefits!" While individuals tend to factor the price of getting divorced into their budgets, they don't always consider other everyday expenses incurred during the process. Narris recommends that clients carve out a little extra money to care for their personal needs during this difficult time. "Factor in a gym membership, therapy co-payments, massages," said Narris. "You will want to be as healthy as you can to help your kids through the process, and you never know when you may have a bad day." It should go without saying that divorcing individuals need to know what their spouses earn monthly, as well as where the money goes. According to a Divorcenet.com article, when considering the cost of future living expenses, it's important to take into account the effect of inflation. Narris recommends keeping receipts so you have a good idea of what everything actually costs. Doing this will help you maintain quality of life after a divorce. Whether you have an emotional attachment to your family home, or are just seeking vengeance against your former spouse, be sure you're thinking wisely about your decisions with regard to shared property. You don't want to discover later that you gave up other assets just to keep a home in which you can't afford to live. When contemplating divorce, it's important to consider what assets you value most and be prepared to let some things go. "A major mistake in divorce, that everyone can get trapped into, is spending hundreds or thousands of dollars fighting for something that you don't even want," said Narris. It might seem like a small matter, but buying nice clothes for court can boost one's confidence. "You will feel better and likely fair better with the judge," said Narris. Of course, clients should remember to keep it professional and avoid dressing in a manner that's flashy or overly pompous. Play it safe by keeping clothing neutral and accessories to a minimum. It's important to remember that divorce law varies by state, and some of these tips might not be applicable in your region. Be sure to find a divorce attorney in your area to advise you on how to get a divorce. Doing this will help protect your assets and property while ensuring the process goes as smoothly as it possibly can. This article, 40 Secrets Only Divorce Attorneys Know, originally appeared on GOBankingRates.com.